Jaypaw shrank down for a moment, then slowly padded over to Amethystcloud. "Ready to learn how to hunt?" Amethystcloud asked Jaypaw. Graypaw puffed out his chest and padded over to Doveleaf. "Let's go work on some fighting moves." 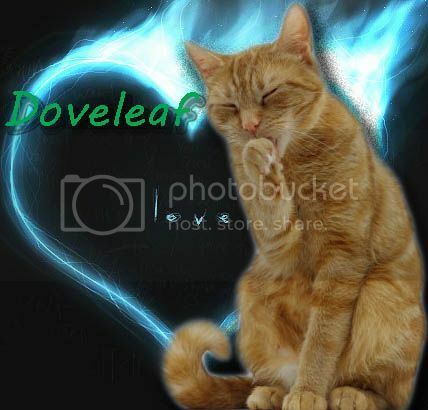 meowed Doveleaf as he touched noses with Graypaw. Sandpaw purred quietly and padded over to Jaysplash. "Mind if we come with you?" meowed Jaysplash to Amethystcloud. Cinderpaw quietly padded over to Moosenose. "Go get to know your new denmates." meowed Moosenose as she touched noses with Cinderpaw. "Squirrelpaw, Jaypaw, Graypaw, Sandpaw, Cinderpaw!" cheered Oakblaze for the clan's newest apprentices. Dreamheart purred and licked at the four tiny kits at her side as they mewled and squealed for milk. As she touched her nose to each kit, she sent a silent thanks to StarClan for a healthy litter.